Caffeine is the most widely used behaviorally active drug in the world and is present in many different types of beverages, foods, energy aids, medications, and dietary supplements. Because caffeine ingestion is often integrated into social customs and daily rituals, some caffeine consumers may be unaware of their physical dependence on caffeine. It is estimated that more than 85% of adults and children in the US regularly consume caffeine. For anyone who has ever tried to quit drinking their favorite caffeinated beverage (my guilty pleasure is fountain soda), you know the associated pains. Headache, fatigue, difficulty concentrating, moodiness, irritability, etc. The new DSM-5 classifies caffeine withdrawal as a potential disorder (page 506-507 if you don’t believe me). Symptoms usually begin 12-24 hours after the last caffeine dose and peak after 1-2 days of abstinence. Caffeine withdrawal symptoms typically last for 2 to 9 days, with the possibility of withdrawal headaches occurring for up to 21 days. Gradual reduction in caffeine is suggested to reduce the incidence and severity of withdrawal symptoms. We’ve all heard about the importance of getting a good night’s sleep, and now scientists offer more evidence to back that up. A new study found that people who get less sleep may be inclined to eat more, move less and gain weight. Scientists at the Mayo Clinic in Rochester, Minn., studied a group of 17 healthy volunteers between the ages 18 and 40 for a week in their homes, monitoring how much each one typically slept and ate. Then, they brought the volunteers into the clinic’s research lab for eight days: Half of the volunteers were allowed to sleep according to their usual pattern, and the other half got only two-thirds of their usual shut-eye. All the volunteers were allowed to eat as much food as they wanted from the hospital cafeteria or from outside the research center. The researchers also measured how much energy each volunteer expended each day. The sleep-deprived participants wolfed down an average of 549 calories beyond their usual intake but burned no more calories than their well-rested peers. Those excess of unburned calories is a surefire way to gain weight, which numerous studies have connected to a variety of chronic health problems. 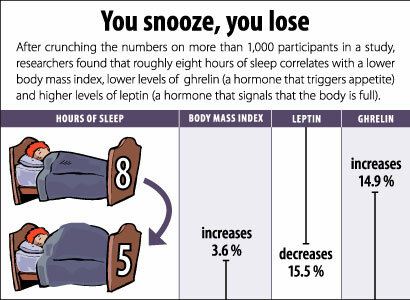 The volunteers who got less sleep also had higher levels of leptin, a hormone that suppresses appetite, and lower levels of ghrelin, a hormone that stimulates appetite, in their blood. The findings seem counterintuitive to what researchers would expect in people who are hungrier, but Calvin said the hormones were most likely an outcome, rather than a cause of people eating more. Scientists have previously studied the physical downsides of getting too little sleep. In 2011, Australian researchers found that adolescents and teenagers were more likely to be slimmer if they went to bed earlier, while those who stayed up late were more likely to engage in sedentary activities. Previous studies have also found that workers covering late and overnight shifts were more likely to be obese and have type 2 diabetes, which may be associated with unhealthy eating habits, according to an editorial published in December. The connection between sleep and weight may be important for the more than one-quarter of Americans who get six hours of sleep or less every night. Calvin said the future research on how sleep affects eating habits may give scientists useful insights into two of America’s biggest health problems: sleep deprivation and obesity. “This study, while small, suggests that these two may indeed be linked, and if the findings are confirmed, they may suggest that sleep is a powerful factor in how much we eat and our chances of gaining weight,” he said. 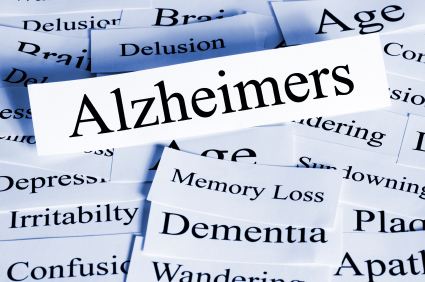 Caring for kids and a loved one with Alzheimer’s, too? Here’s how to make it easier — for everyone. The herpes simplex virus type 1 (HSV1), the virus that causes most cold sores, has previously been tied to the development of Alzheimer’s disease. Antiviral drugs used to combat herpes virus infections could slow the progression of Alzheimer’s disease, a new study suggests. Five years ago, Colton and Mandersheid surveyed mortality data from eight states and concluded that, on average, Americans with major mental illness die 14 to 32 years earlier than the general population. The average life expectancy for people with major mental illness ranged from 49 to 60 years of age in the states they examined — a life span on par with many sub-Saharan African countries, including Sudan (58.6 years) and Ethiopia (52.9 years). Average life expectancy in the United States is 77.9 years. It would appear that the increase in longevity enjoyed by the general U. S. population over the past half century has been lost on those with serious mental illness (SMI). In fact, this drop in life expectancy due to mental illness would surpass the health disparities reported for most racial or ethnic groups. Yet this population is rarely identified as an underserved or at-risk group in surveys of the social determinants of health. Why is there such a profound disparity in life expectancy for those with SMI? Disorders such as schizophrenia, major depression, and bipolar disorder are risk factors for suicide, but most people with SMI do not die by suicide. Rather, the 5 percent of Americans who have SMI die of the same things that the rest of the population experiences — cancer, heart disease, stroke, pulmonary disease, and diabetes. They are more likely to suffer chronic diseases associated with addiction (especially nicotine), obesity (sometimes associated with antipsychotic medication), and poverty (with its attendant poor nutrition and health care) and they may suffer the adverse health consequences earlier. The risks are striking. People with a mental illness are more than twice as likely to smoke cigarettes and more than 50 percent more likely to be obese compared to the rest of the population. But this only partly explains the premature mortality. Recently, when Druss and colleagues analyzed the early mortality data derived from a nationally representative survey, they found three drivers: clinical risk factors, socioeconomic factors, and health system factors. The clinical risk factors include the frequent co-occurrence of mental illness with heart disease, diabetes or other medical conditions, generally referred to as “comorbidity.” For example, people with major depressive disorder are at higher risk for cardiovascular disease and stroke. Conversely, for those who have had a heart attack, experiencing depression increases their risk for cardiac-related death three-fold, more than any cardiovascular variable except congestive heart failure. And people with diabetes have double the risk for depression. We do not fully understand the relationship between diabetes or heart disease and depression, but current thinking attributes the increased risk to both depressive behaviors (e.g., poor diet, low activity, low adherence to treatment) as well as some common biology such as elevated inflammatory factors. 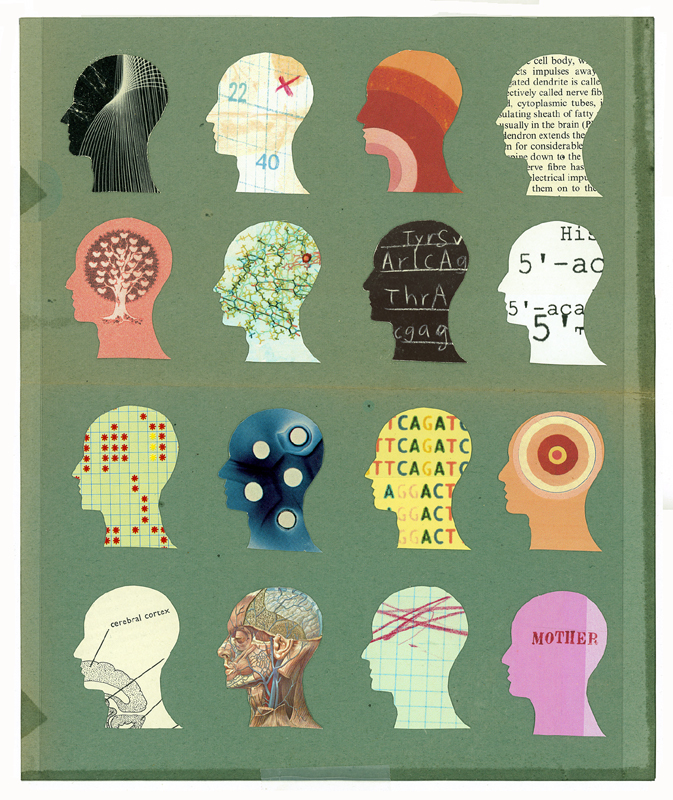 While we are still trying to understand the cause of comorbidity between mental disorders and other health problems, the health system factors may offer a better short-term target for change. Few people in the public mental health care system are receiving high quality health care. The Patient Protection and Affordable Care Act outlines a specific model of integrated care, the patient-centered medical home (PCMH), which could improve access and quality of health care to those with multiple chronic disorders. The PCMH model includes comprehensiveness, holistic patient-centered care, and, emphasis on care in the community. The Centers for Medicare and Medicaid Services has been tasked with piloting a series of PCMHs and studying their impact over the coming years with the goal of wider dissemination in the future. Knowing that people with SMI are a high risk group for multiple chronic disorders and targeting the PCMH for their specific needs could be an effective approach to improving health outcomes for the entire population. Short of a new health care system, there are models for improving health outcomes for people with mental illness. Collaborative care, in which primary care and mental health providers work closely together to deliver effective treatments within the primary care setting, represents a fundamental change toward addressing mental disorders in conjunction with other physical conditions. Over the past two decades more than 40 research trials have demonstrated the effectiveness of the collaborative care model. In the case of major depression, for example, studies have shown collaborative care programs to be an effective approach for treating depression alongside other conditions, and to be more cost-effective than standard treatment. A recent study indicates that implementing this approach for depression in the Medicare system would result in cost savings of approximately $15 billion annually. Collaborative care for depression and diabetes or depression and heart disease is the proverbial low hanging fruit. What about schizophrenia and bipolar disorder, which are usually treated in specialty mental health clinics rather than primary care? Is it better to add primary care capacity to the behavioral health center or to integrate patients with SMI into primary care? Can our current system, which separates behavioral health from health care, ever be “equal” in quality or outcomes? These remain research questions of urgent importance. The unavoidable fact is that we will not improve overall longevity or contain health care costs in this nation without addressing the needs of the nearly 5 percent of Americans with serious mental illness. This is a population that not only dies early; they have multiple chronic diseases requiring expensive care, often in emergency rooms and intensive care units. We need better strategies for dealing with this urgent public health issue and we need to ensure that whether these strategies are collaborative care for depression or an innovative medical home for those with serious mental illness, we implement these interventions where the need is greatest. Many older people forget someone’s name or misplace things from time to time. This kind of forgetfulness is normal. But, forgetting how to get home, getting confused in places a person knows well, or asking questions over and over can be signs of a more serious problem. 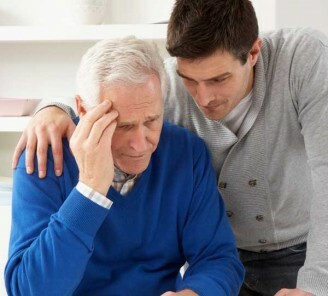 The person may have Alzheimer’s disease, a disease of the brain that begins slowly and gets worse over time.